People define for themselves what they value, and thus, what they deem relevant. But that doesn’t mean relevance is a pure trait, fixed within each person’s identity. You can make something relevant to anyone. Immediately, you’re on your way to the auditorium—or figuring out how to get there. You’re looking around to see who else is a three. You’re wondering what will happen when you get to the auditorium. Suddenly, all these things are relevant to you. In fact, it’s probably a bit hard to even recall where those other people were assigned to go because you became focused on your particular task as a number three. All things “three” are now relevant to you. The other numbers are not. We manufacture this kind of relevance for each other all the time, to positive and negative effect. On the positive side, you can make something relevant with an externality—even an arbitrary one. On the negative side, when someone thinks something isn’t relevant to them (like all those other numbers), they completely block it out. It’s rare that someone tells you, “you are a three,” but every day people tell you – directly and indirectly, correctly and incorrectly – who you are and what is relevant to you. You’re a boy; use this restroom. You’re black; do you play basketball? You’re overweight; you don’t belong at this nightclub. You’re elderly; try the low-impact aerobics class. You’re Jewish; have you read this book about Israel? Our differences are like individual keys crowding our key rings, bouncing around in our pockets. They open certain doors and not others. We start with the keys we were given, by our parents, teachers, and peers. They are partly internally defined and partly determined by societal norms. These norms define what doors we see as appealing, or open to us, as we navigate potential experiences. This doesn’t mean we can’t transcend these categories and acquire new keys. We can and we do, every day. But we continue to carry the keys given to us, even if they’re not the ones we would have chosen. If you’re going to open new doors—especially doors to the heart—you have to start at the front door. You have to show that you are inviting people in on their terms, with generosity, humility, and a nod to what speaks to them. Effective front doors have greeters who look like your community welcoming them at the door. Speaking their language. Providing entry points that match the keys they use every day. Opening that first door is important. But if you only engage at the front door, your relevance will be limited. If your institution wants to be relevant to Latino people, you can’t do it once a year on Cinco de Mayo. If your institution wants to be relevant to young people, you can’t do it with a marketing campaign alone. Why not? Because the front door is only the introduction to the experience within. If a newcomer opens the door and has a lousy time in the room, or if she only feels welcome at specific times or events, she may start questioning the value of the key in her hand. Why did I think that experience would be relevant to me? Why didn’t it yield the kind of meaning I had hoped for? If that Latina mom encounters enough uninspired, superficial cultural festivals, she may opt out in the future, no longer assuming they are relevant or valuable. But if she walks through the door and the experience is brilliant, she’ll keep the key. She walks out satisfied and appreciative of the institution as a place that offers satisfaction. She walks out curious about what else it can offer her. The more you start to matter to people, the more they will desire opportunities to go deeper into the room of what you offer. They will come back and ask for more. They will demand their own keys and their own doors. If you are struggling with this tension, rejoice. It means that people want to go further with you. It also means they expect more of you. 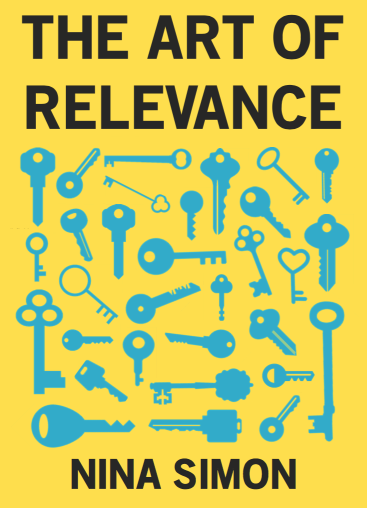 Relevance is a process, not a momentary door flinging open. Most people experience relevance gradually over time, as their lives bring them back to the same room again and again, for different reasons at different times. Institutionally, we cultivate relevance when we invite people to go further with us, deeper into the room. Sangye found her voice at our museum. Now, the museum is deeply relevant to her, not just as a place to do research, but as a place to connect with friends, make discoveries, and contribute to the community. Everybody starts at the front door. People need a reason to walk through the door the first time, and more likely than not, it will be based on something they already expect you to offer, something that fits the keychain the world handed them. But if you can go deeper, you can go further. If you can be relevant to how people define themselves in their hearts, you can open up more doors. You can reach people who weren’t societally selected into your room. You can build a bigger room. You can matter more to more people.